In last week’s post, I showcased three resources I use that offer the same text at multiple reading levels to help you scaffold reading tasks for less proficient readers. Sometimes, though, you don’t have the luxury of choosing your own texts for use in the classroom. Or, you may have a specific text you want to use written at a level not yet accessible to some students. In that scenario, these resources can be helpful. While you may have to register for access, all of these tools are online (no downloading or installation of apps) and they’re FREE. This website lets you copy and paste existing text (or key it in if there’s no copy option), highlighting difficult words and substituting simpler alternatives. For example, if a text reads “A brutal cold descended on Chicago…” Rewordify translates this to, “ A violent/difficult cold move downward/originated upon Chicago…” As you can see, it’s helpful for identifying words struggling readers are likely to stumble over, and for suggesting a simpler way to say each one. Unfortunately, the resulting text still needs to be reviewed by human eyes and a brain and tweaked to produce the more readable “A terrible cold moved down into Chicago.” Frankly, I use this more to identify vocabulary words I want to teach explicitly than as a translation tool. Some teachers like to teach students to use it themselves as a vocabulary-building/support tool. Rewordify also has a library of 300 simplified classic texts. PROS: Ease of use; identifies challenging vocabulary and suggests simpler word/phrase substitutions; automatically generates word lists and vocabulary-building activities. CONS: Translations are often cumbersome and make it difficult to follow the passage’s train of thought. PROS: Quickly translates a given text into simple English. CONS: Inconsistent results; unable to “read” and translate some texts correctly. Using a simple formula that measures how many times a key word is used in each sentence, this website condenses text into a tight summary. It doesn’t actually substitute words, but it does analyze the passage, eliminating what it perceives as unimportant details to focus readers on the main messages. It’s a time-saver for summarizing news articles (where writing tends to be more formulaic), but don’t even bother using it with narrative texts. PROS: Helpful for summarizing, especially when teaching students to determine central idea in nonfiction. CONS: Doesn’t work with literature. Does not reword text, just eliminates elaboration and detail. If you teach Language Arts, chances are you already have strong writing skills. Plus, who knows your students–and which words they’re likely to stumble over–better than you do? If you want to modify a given text yourself, you’ll find the following tool helpful for measuring the text’s original level and checking the readability of your redrafts. Input the text you want to analyze, click a button, and this tool tells you the Lexile range, mean sentence length, mean log word frequency, mean log word frequency, and word count. Substitute complex words for simple words (ex. “brutal cold” becomes “very cold”). Shorten complex sentences into two or more simple sentences. Use simple Subject-Verb-Object sentence structures. PROS: Quickly analyzes texts and reports Lexile range. CONS: Results are reported in a 100L range rather than a specific Lexile level. Making complicated texts accessible to those students who struggle to read on grade-level text is critical to their long-term success. Hopefully these suggestions will help reduce the burden of delivering such scaffolding, leaving you more time to focus on building relationships and creating lessons that inspire! The trend in recent years has been toward mixed-ability classrooms, meaning it’s up to teachers to adapt material to meet the needs of students at many different reading levels. Nowhere has this been more apparent to me than in my Intensive Reading classes, where a single class may include 8th graders whose reading level ranges from roughly grade 2 to grade 8. If you’re reading this post, no doubt you know how challenging it is to differentiate for such a range of ability-levels, and you’re looking for a viable solution (translation: a method that does not consume all your personal time and mental energy). Good news: There are several ways you can modify texts, or find modified texts, to make them accessible to all students. In the next two posts, I’ll describe the ones I use often and with success. This resource contains thousands of informational articles, each written at 5 different reading levels. Along with each article are vocabulary exercises (Power Words), writing prompts, and standards-based questions to measure reading comprehension. The program automatically assigns the reading level that most closely matches their grade, but students can adjust it up or down to suit them. That said, teachers can assign an article at a specific reading level. Students must complete the article and activities at that level before they can access it at a different level. If you have students who get text-to-speech as an accommodation, you’ll need to use the Newsela app or a browser plug-in to deliver it. PROS: Easy to set up accounts and classes using Google, Microsoft, or Clever. Articles are available and assignable on multiple reading levels. There are even Spanish language versions of articles. CONS: Nonfiction articles only. Assignment level customizable only by class, not by student. Both literature (fiction and poetry) and nonfiction are available on this free site for teachers. There are hundreds of articles available for grades K-12, searchable by topic, genre, and Lexile level. Though most articles are only available at one Lexile level, Readworks is developing “Step Reads” which offer an additional level of readability. Articles include a text-to-speech function; however most use a computer-generated voice. Check out the eBooks, though, for engaging graphics and human-voice reading. Each article includes vocabulary and text-based questions. PROS: Includes fiction and poetry as well as nonfiction, text-to-speech for articles and activities. Easy to create classes, assign and track student progress on assignments. CONS: Limited supply of differentiated texts. Offers many high-interest and topical news articles, each on four different reading levels. It’s free to teachers and students with simple account/class setup. New articles are added every day, and many include simple multiple-choice questions. It includes an optional “student comments” feature you could use to encourage text-based writing. PROS: Engaging articles and graphics, all with a range of reading levels. Includes lesson plans that can be adapted for different grade levels. CONS: Nonfiction news articles only; quizzes test simple recall rather than deeper comprehension; broken links made navigation frustrating at times. In my next post, I’ll share tools you can use to simplify any text with a quick cut and paste! Disclosure: This post contains one or more affiliate links, which means I may earn a small commission should you click on the link and purchase the recommended product. This doesn’t cost you any extra money, nor does it influence my recommendations. It does help cover the costs of hosting this site, though. Thanks for your understanding and support. One of the cornerstones of reading comprehension is knowledge of vocabulary. In fact, experts believe that comprehension is possible only when students already know 90- to 95-percent of the words in a given text.1 That’s why effective vocabulary instruction is vitally important for every level and subject. On average students need to learn between 2-thousand and 3-thousand new words each year, just to keep up with their peers.2 Those who read outside of school will easily manage this, since just 20-minutes of independent reading a day puts children in contact with over 2-million words.3 But, what about students who don’t read outside of school? What about those who come from homes where English isn’t even spoken? These students, along with those whose vocabulary acquisition has already been hampered by a learning disability or deficit socio-cultural environment, will fall further and further behind without focused vocabulary instruction. I never saw it before. I’ve seen it before, but I’m not sure what it means. Even though students need variety in vocabulary instruction, there are some practices proven to be highly effective. 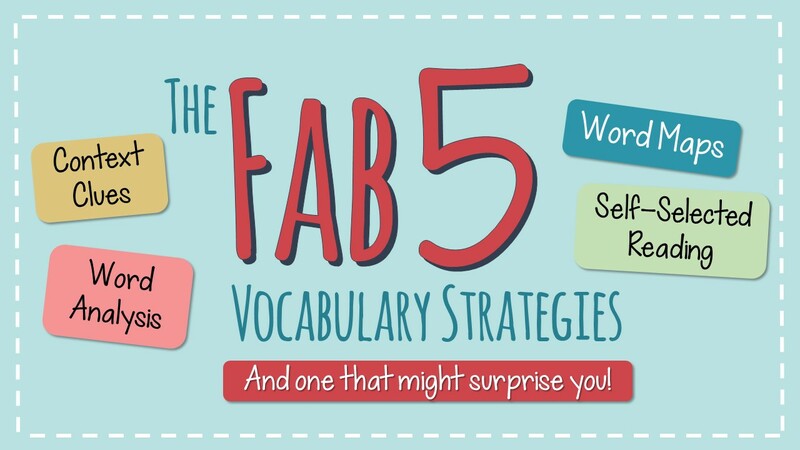 I call these the “Fab Five” Vocabulary Strategies, and they include both direct and indirect instruction. Teachers should strive to teach about 400 words each year through direct instruction.2 (I know that would make for some intimidating weekly word lists, but you can leverage knowledge of word roots and affixes here.) Even though direct instruction implies a teacher-led activity, actively involving students in the learning process, by using discussion, graphic organizers or self-evaluation tools, increases understanding. Of course, it is also important that the words be relevant. The best way to ensure this is to link vocabulary instruction to texts the students are currently reading. Peruse class texts in advance to identify potential vocabulary words you can use during explicit instruction. Morphology involves segmenting words into their component parts: base words, roots, prefixes and suffixes. Students who learn the meaning of common roots and affixes (prefixes and suffixes) can apply that knowledge whenever they encounter a new word that contains a known component. For example, a student who knows that –port- means “to carry” and -able means “able to” can assume that portable means “able to be carried” even if they are encountering the word portable for the first time. They can then apply that knowledge to new words containing these word parts: transport, portal, or transit. There are a number of great resources for employing word structure analysis in your classroom, such as this one from Read.Write.Think. or this one from the Florida Center for Reading Research. My post on tinycards also included a link to existing root word flash cards I’ve used with great success. Use graphic organizers to encourage students to interact with new vocabulary. The Frayer model is an effective one, where students list examples and non-examples of the word, as well as key features and characteristics. I also use a chart like the one modeled here to guide students through Marzano’s 6-Step Vocabulary Acquisition process. 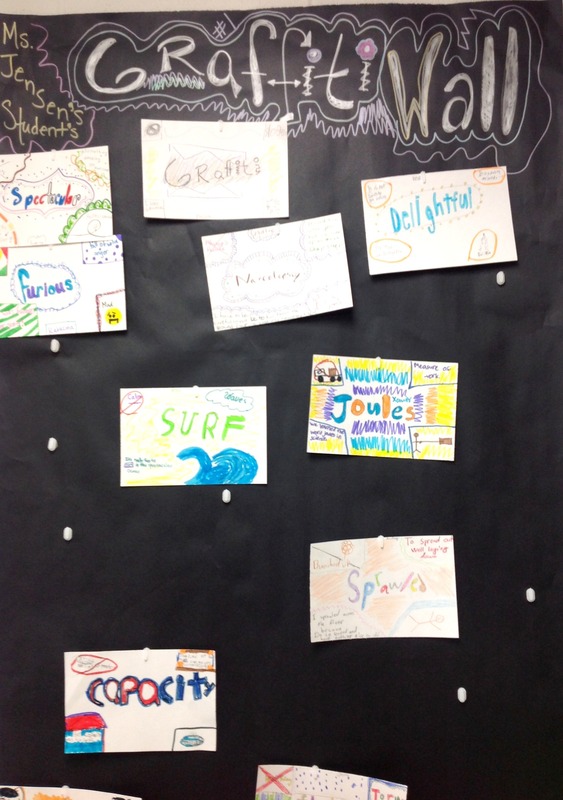 You can even modify and display student-created word maps using a Graffiti Wall like the one pictured to the right. Here, the Frayer model was adapted to include artistic elements, then displayed so students (and the teacher) could easily review new words (which reinforces retention). Nothing new here. You are probably already teaching your students to use context clues (words surrounding an unfamiliar term that hint at its meaning) to determine the meaning of unknown or multiple meaning words. Modeling use of all the different types of context clues and pointing out the signal words associated with each type will help them maximize word acquisition during independent reading. Here are the types of clues I teach and the order I use: definition, restatement, synonym, comparison, antonym, contrast, example, cause and effect, and inference. When I first started teaching, I tried to teach all nine types at once. I quickly learned it is more effective to introduce them one at a time, allowing students to spend more time practicing them and keeping the strategy at the forefront. It’s important to track this independent learning, so you and students can review what they’re learning. In a future post, I’ll share my method for tracking reading and teaching writing at the same time. But, you could also use one of the graphic organizers mentioned above to have students document new vocabulary words. Some teachers also like to use a reading journal, reserving space in the back for a student-created glossary. If it seems like the line between direct and indirect vocabulary instruction just got a bit blurry, that’s because it is. We need to explicitly teach students vocabulary strategies they can continue to use outside of the classroom. Throughout their lifetime, they will encounter new words, conversing with friends, reading texts in other content areas, as they learn a new profession someday. Teaching vocabulary means equipping them with word knowledge they need to immediately make sense of a specific passage, but it also means training them to utilize skills for understanding the tens of thousands of new words—some of which haven’t even been coined yet—the future holds for them. Yesterday was the first day of school in our district, and I wanted to share a lesson I debuted that exceeded all expectations! In fact, I’ve never been so excited or felt so connected to students AFTER JUST ONE DAY as I do right now. That’s why I dropped everything to share it with you. Our middle school asks teachers to develop social contracts with students. If you aren’t familiar with the term, it’s basically a signed document listing the expectations that students and their teacher agree to have for one another. The idea is that everyone takes time to consider the classroom environment they’d like to have and acknowledge their role in creating it. There’s a standard list of questions (What would you like our class to look like? What do you expect from the teacher?). Generally, a student records responses for the class to discuss and eventually agree to endorse. It’s a solid concept that does start the year off on the right path. However, in a middle-school setting where students and teachers have 7 to 8 different classes, you can imagine how repetitive the process gets to be. So, this year, we were given license to adapt the process to suit our individual classroom content and style. And that’s what led me to try something new. Here’s what we did. Before students arrived, I arranged the desks into groups of four. I greeted them at the door as they came in, introduced myself and invited them to sit in the group of their choice. (If you have a student survey, collect student data on index cards—or any simple task that requires no more than a few lines of directions written on the board—this is an excellent way to keep everyone engaged while you greet those still arriving.) Once the bell rang, I took care of the usual housekeeping items: personal introduction, attendance, name pronunciation, and need-to-know basics for entering or leaving the room… you know, the standard stuff. Next, I introduced the day’s activity with this presentation. (Just in case your perfectionism is as bad as mine, here’s a copy of the speaker’s notes I mapped out. I updated them to reflect improvements made after delivering the lesson five times.) After identifying the standard and Marzano-scale associated with it (yes, we do these for EVERY lesson, even on Day 1), I asked if anyone was familiar with TED Talks. In most cases, I had to explain that TED Talks were speeches given by someone who was an expert on the topic, a speech that was filmed and loaded to the Internet so anyone could share the expert’s information. I noted that we were going to watch a TED Talk called Everyday Leadership. Next, I show the video (just 6-minutes) without interruption. In the video Drew Dudley tells the story of a girl he met during her first day of college. Unbeknownst to him, she was so full of fear and self-doubt that she’d made the decision to quit school, but through one humorous interaction between strangers, he put her at ease and in the process changed her life. She didn’t tell him until four years later, and in revealing how his small act of kindness made him an important person in her life, she in turn helped him realize his own value in the world. After we watched the video, I presented students with questions to discuss with their group and briefly reminded them of the collaborative discussion traits outlined in the lesson scale we went over (listening while others talk, adding comments and asking on-topic questions). Then, I circulated as groups talked, prompting as needed. I expected to do more redirection of off-topic conversations, but the subject and story-telling in this video was so engaging students stayed focused almost without exception. After a few minutes of discussion, I asked each group to choose a spokesperson to share their answer with the class. I let them know the role of spokesperson would be shared, so a different person would be speaking for the group on each question. Incidentally, watching how each group selected their speaker–not to mention circulating during the discussion–helped me spot the natural leaders, the quiet-but-thoughtful ones, and those who struggle with comprehension or focus. 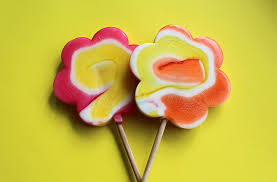 If your schools allows treats, while students discuss the second question you can pass out lollipops to everyone. It breaks the ice, puts everyone in a positive frame of mind, and it’s a rare opportunity where enjoying sweets IS reinforcing the point of the lesson. As students shared their thoughts, we learned a lot about one another’s values, experiences, and communication style and ability. The greatest insights were revealed when students shared their “lollipop moments.” Before asking them to discuss this, I acknowledged that this particular question required them to be brave. Sharing an important moment in your life, especially in a group of people you don’t know well, means risking vulnerability. At this point, we’d already seen the video and discussed how the girl felt scared and alone until Drew’s actions showed her the people around her were nervous too. I shared my own “lollipop moment” to spark the conversation, and then I circulated, listening thoughtfully as students candidly shared moments where they’d been either the recipient or giver of a small act of kindness that had a big impact. 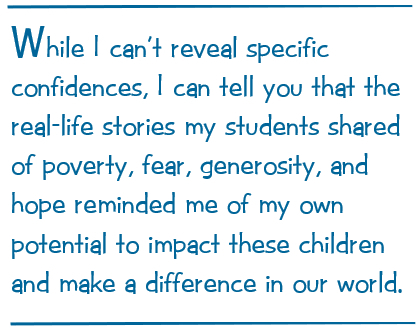 While I can’t reveal specific confidences, I can tell you that the real-life stories my students shared of poverty, fear, generosity, and hope reminded me of my own potential to impact these children and make a difference in our world. Don’t you just love it when a lesson you design to inspire others, fuels your own passion in turn? I can say with some degree of certainty that my students felt the same. As they worked on the culminating activity – identifying one word that summed up the actions of either Drew or the girl (kindness, generosity, appreciation) and brainstorming other acts that demonstrate that trait—they were already modeling helpfulness and respect toward one another. I could see that those values, and the idea that our classroom was a safe place in which we could trust one another, were already taking root. Over the next few days we’ll formalize our social contract, spelling out these values that we now embrace. More than ever before, though, this contract has spilled over the edges of the page and the ideals it represents are already embedded in our class culture. Thanks, Drew! No doubt you’ve seen a common craft style video—a one-take “How To” production that uses 2-D illustrations and hand gestures to explain a process. Here’s an example of a common craft video that explains how to create a common craft video. Incidentally, I use this very example to introduce the project to students. While Mr. Fogle states in the video that it takes about 15 minutes to complete the project, my classes work on it for two weeks. Equipment needs are minimal: a video camera (iPhone or iPad apps are ideal), a desktop or space on the floor as your “stage,” and a light source (I use a clip-on work light purchased for less than $10). The project basically entails six steps: 1) Form groups, 2) Choose a topic, 3) Write the script, 4) Design the props, 5) Rehearse the video, and 6) Record the video. I perform a seventh step, editing, which takes me about an hour using a video editing app on the iPhone we use to record student videos. A fun “premiere day” serves as the culminating activity – usually the last day of school – where we all eat popcorn and watch everyone’s finished projects. Students work in groups of four, and again, I like to let students choose their own groups. Before they do, though, I tell them what skills need to be represented in each group. First, they need a writer to write or type out the script. Next, they need an artist to design the props. Third, they need a fluent reader to narrate the video. Finally, they need a camera operator who will also direct the video. You can combine the roles in a pinch, but you will need at least three students per group to manage moving the props on and off camera. The script includes BOTH the narrator’s lines and a description of the props and hand gestures that will be used to illustrate each scene of the video. Script-writing requires them to break down their topic into management steps or components, and to come up with a way to depict each one. I give students this script template to guide them through the creative process. Once the script is written, they also have to time each scene to be sure they have content to fill at least two, but no more than three minutes of video. In most cases, props consist of simple line drawings, though a smattering of small objects (pencil, combination lock, etc.) can be used to add visual interest. Caution students against using more than two actual objects as it creates visual clutter. Illustrations MUST be 5”-7” tall and should include bold outlines (refer to Mr. Fogle’s How-To video). Black and white drawings work just fine, but most of my groups like to spend time coloring their artist’s creations—and I usually let them linger over this relaxing activity since this time of year they are often testing in at least one or two classes every day. Remind students to make a “Good” and “Bad” card prop to hold up at the end of the video to mark whether or not it is their final take. Show students how to use a desktop as a “stage.” Alternatively, you can use a piece of poster board or a length of bulletin board paper on a desk or on the floor. Use painters tape or draw lines (I sometimes draw lines on the desktop with marker–it scrubs off with a magic eraser) marking which areas will appear onscreen and which will not be seen in the video. One student (on the left) will push props onscreen at the appointed time, while another student (on the right) will pull props offscreen at the end of the scene. Have them practice this process while the narrator reads the script aloud. The director should time them and provide feedback about the speed of the narration and movements. I tell students that when they are happy with their performance, and have done it at least twice without error, they are ready to record. If you have a quiet place, like a small office or walk-in supply room, it’s best to use this as your “recording studio.” That way, other students can practice quietly in your classroom while each group is recording their video. I use an old iPhone as a camera (shown above), but any digital video recording device works. The camera should be positioned a few feet above the surface where the props will be displayed. If you have a tri-pod, that’s great. For years, though, I used a cardboard box with a small hole cut in the bottom for the camera lens to peek through. I positioned it above a sheet of black poster board lying on the floor. This year I upgraded my equipment, using a tripod with an iPhone mount that came with a handy remote “record” button. Set up the camera first, then use painters tape (placed just offscreen) to mark the edges of the visible portion of the poster board. As each student group is ready to record, I show them how to operate the camera, turn on the shop light (bounce it off a wall or sheet of paper rather than aiming it directly at the props to avoid washout), and remind them to count silently to three at the end of their final take before displaying the “Good” card onscreen. Honestly, even though they’ve practiced, they usually get overly excited and flub their first or even second take… so plan on allowing about 6 or 7 minutes for each group to record their final video. If your students are tech savvy, you could have them complete this step. However, I generally handle editing myself simply for the sake of convenience. Since these are one-take videos, I edit them right on the iPhone using the iPhone app. (If you’re using a digital camera or laptop to record them, this software suite is a very user-friendly option, that lets you add titles, special effects, and more.) Editing is where the “GOOD” and “BAD” cards are so important. (Thank you again, Mr. Fogle, for this brilliant idea.) All told, I’ll have roughly 100 video clips to review (2-3 per group X 36 groups). Anything less than 45 seconds long can be deleted without viewing since it’s obviously an aborted attempt. You don’t have to watch each video, just skip to the end and look for the good or bad card, and delete those ending with the bad. Once you’ve culled out the bad videos, trim the end to eliminate the frames displaying the good card. If you’re a perfectionist (and let’s face it, it’s a cross many teachers must bear), you can use the cropping tool to make sure the props are centered, and no edges show onscreen. As I mentioned early, I usually have a video premiere day the last day of school where students get to watch everyone’s videos. It’s a lot of fun, especially if your school will let you serve popcorn, and the kids enjoy their moment in the spotlight when they get to share their group’s creation with peers. I’m fortunate to work at a school that encourages the sharing of student-created resources as well. So, in addition to sharing their videos with my other classes, selected student-videos are also shown to next year’s incoming 6th graders during a summer camp orientation program, and teachers show them during the first weeks of school to introduce school procedures and culture. I’ve even been permitted to upload them onto a YouTube channel to facilitate distribution and sharing (which adds a whole new level of cachet and incentive to create the best of its kind each year). This brings up an important point about privacy and security. One of the advantages to using a common craft style video is that it does not show any student’s face or features (a big no, no in our district). I also caution students NOT to include their names in either their video title or credits – for privacy reasons. Word games are a wonderful way to incorporate vocabulary activities into your classroom. Word searches and crossword puzzles reinforce spelling skills, and if you use word definitions as clues rather than giving students a word bank, it aids retention of new vocabulary and encourages critical thinking. The word ladder is another brain-building activity involving word play. Word ladders challenge players to identify a string of words all having the same number of letters. In fact, each word shares all but one letter with the word immediately above or below it. Using the given clue for each word, players must change just one letter to form a new word that satisfies the given definition or clue. The simplest puzzles, suitable for younger children or ELLs, involve just three- or four- letter words and have fewer rungs, or words, moving through words like walk… talk…tale… and tile. More advanced puzzles use longer words with more challenging vocabulary, like halved… halted… halter… falter… filter… and so on. Here are some word ladders I created for my 6th grade intensive reading classes (where every day either begins or ends with vocabulary practice). I start them out with four-word puzzles, until they get the hang of it. Then we progress to five- and six-word ladders. I let them work with a partner, so students engage one another in dialogue about the target words and definitions (a sneaky way to add an auditory learning component). The first time they work through a word ladder it might take them 7-10 minutes, but as they gain experience with this activity, they can easily complete one in under five minutes. For me, this makes word ladders the ideal bell ringer or enrichment activity for fast finishers. The activity is inherently fun, and students love to compare their finished puzzles with their peers’, so it’s a self-checked learning activity that requires no grading! You can create your own word ladders with this free puzzle-maker by edu-games.org. If you want to build a puzzle using specific words (or create a themed puzzle) you can generate a word ladder list on this site created by Stanford professor Keith Schwartz. Looking for something a little more turnkey? You’ll find read-to-play online word ladders at turlediary.com (for grades K through 3) or sporcle.com. There are word ladder apps for the iPad like this one by Ventura Educational Systems (costs less than $1). Access print-ready word ladders at puzzlechoice.com. This scholastic resource for grades 4 through 6 is the book that first introduced me (and by extension my students) to word ladders. I still use it as a go-to for quick bell ringers or extension work. If you’re looking for a low-prep, high-value vocabulary activity to add to your teaching toolbox, I heartily recommend Word Ladders. One of the first reading skills I address each year is making inferences. It’s the cornerstone of using context clues, identifying character traits and motivation, analyzing plot, theme, and more. In addition to its obvious necessity for reading comprehension, they’ll make inferences for science, history, and other subjects. Now, most students are already able to make inferences. They can read a friend’s body language and identify whether that friend is excited or distressed. What many need to be explicitly taught, though, is the components used to make inferences—background knowledge (or schema) and evidence—and how to search for that evidence. It is often also necessary to stress that an inference reflects the “most likely” scenario, and not just something that is remotely possible. For instance, if I read a text in which a character appears fully dressed, wet, and it is raining outside and ask students to infer why the character is wet, inevitably, someone wants to suggest that “they fell in a lake” or “they went swimming in their clothes.” (Sixth-graders are notorious for playing the “what if” game and seem to love to let their imaginations run wild on this one.) While I praise their creativity, I point out that since the most likely reason is that the character just came in out of the rain, other response—no matter how creative—are not accurate inferences. So, in addition to teaching them how to draw a conclusion using evidence and schema, they also need to weigh all the possibilities, choosing the one that is most likely. In a previous post, I wrote about how I use pictures to introduce inferences to my students. I also use several free online resources including this virtual pen pal activity. I can also recommend this YouTube video by MrSato411. Younger students might appreciate these interactives: Riddle Game or the PBS Detective Game. 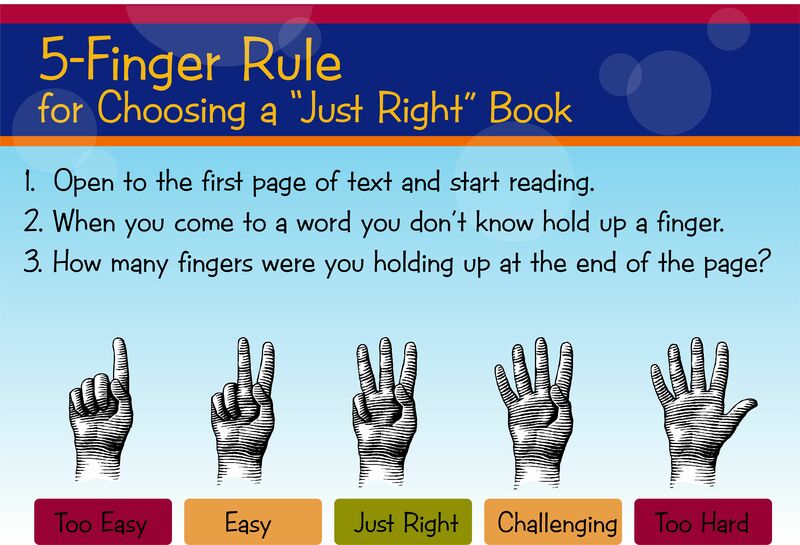 One of the more challenging aspects about teaching reluctant readers is engaging them in their own learning. I get it. I am the world’s worst at bowling. When date night rolls around, and my hubby says, “We haven’t been bowling in a while,” I cringe and quickly offer alternatives to an activity that’s certain to end in frustration. On those rare occasions when I roll a strike, however, I am elated. I shout, I strut, I bask in my success… and, important parallel here, I eagerly agree to play again. Helping my reluctant readers feel the thrill of success—one that’s relevant to reading—encourages them to see themselves as capable readers and to commit to the learning process. Reluctant readers, while not as proficient with text, are generally very good at reading other visual cues. Using pictures to introduce reading skills gives students a frame of reference to understand the basics of the skill, and it shows them they already possess the skills they need to master it. Many reading skills can be equated to interpreting visual images. For example, I often use photos to introduce mood in literature. I show students a series of images and challenge them to analyze the mood conveyed by each. Once they’ve identified the mood (and their success rate is 100%), I challenge them to tell me why. They study the picture and name specific characteristics (the colors are dark, the weather is stormy, there’s a dark alley with a shadowy figure) that lead them to conclude the mood (dangerous). Now that I’ve trained the students to study small details to determine the mood, I substitute short text for the visual images. You can even use a one-paragraph description of the same image you just showed them, so they can see the connection between the visuals and descriptive text. I’ve used this method to successfully teach inferences, mood and tone, cause and effect, point of view, and main idea. It is the perfect way to introduce context clues, or use picture warm-ups to reinforce the concept of context clues in subsequent lessons. Not only do students find pictures engaging, they are also quite memorable. Years later, I’ve had students come to me saying how much they enjoyed–and learned from—those lessons. One former struggling reader confessed, “I don’t know what you did… but I’ve gotten A’s in English ever since.” Inspiring words for any teacher. Teaching middle school English and Reading is my "encore" career, a passion I chose to indulge ten years ago, after 20 years in marketing and corporate communications. I love the collaborative nature of teaching, and love sharing ideas and lessons with peers like you! Enter your email address to be notified when new resources and freebies are available.